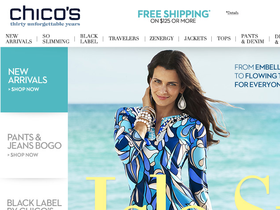 Shop Chico's online at chicos.com, for stylish women's clothing and accessories. For over 25 years, Chico's has been helping women look and feel fabulous with a chic collection of eye-catching jackets, blouses and shirts, sweaters, trousers, pants, denim, dresses and skirts, work wear, evening wear, active wear, travel clothes, jewelry, scarves, belts, bags, ladies' shoes, and more. Chico's knows style with impressive new prints, hot colors, and the latest patterns. But before you shop, be sure to get all the latest chicos.com discounts, Chico's promotions, and Chico's coupon codes found here at RetailSteal.com. Chico's ships within the United States, APO/FPO addresses, PO boxes, and internationally. See site for shipping options and rates. Shop at Chico's and enjoy 20% savings on all orders. Click here for code. Get a 10% discount sitewide from Chico's when you sign up for email. Click here now to shop and save. Shop at Chico's and save $25 on your purchase $100+. Click here to shop. Save up to 80% on women's apparel on sale at Chico's. Click here to shop the great selection today. Save up to 50% or more on ladies' pants from Chico's. Click here to shop and save. Enjoy the buy one get one 50% off discount on new jewelry from Chico's. Click here to shop today and save. Enjoy a 5% discount with every order from Chico's when you sign up for the Passport Program. Click here to shop. Pay only $5.95 for shipping on all orders from Chico's. Click here now to shop and save. Shop the So Slimming Pants collection, starting at $75 from Chico's. Click here to view selection and save.